Thank you to La Brea Bakery for sponsoring this post! Pizza is pure bliss, don’t you think? There’s just something about that crispy-chewy bread crust topped with sauce, oozing cheese and any variety of toppings that speaks universal comfort. I enjoy all kinds of pizzas, everything from the quick and simple to the more time-consuming and elaborate. Today we’re going to make a pizza that’s ready in 10 minutes, the perfect go-to snack, lunch or dinner when you’re in a hurry. For today’s recipe we’re recruiting the help of La Brea Bakery. They’re regularly ranked the nation’s premier artisan bread and make over 200 varieties of hand-crafted bread. They’re made without any artificial flavors, colors or preservatives, are Kosher Pareve, and are the only national line that includes sprouted whole wheat flour. For today’s recipe we’re featuring their Naan Flatbread. What I love about their naan is its light and crispy texture and its versatility. It’s perfect for creating a whole range of appetizers and entrees or simply using it as a table bread to complement sauces and dips. And I do have a small confession to make. This bread is so good that I’ve gone to the store 4 times in the past two weeks just to get more of this Naan Flatbread along with La Brea Bakery’s Telera Rolls! It’s just been so doggone fun creating quick and delicious meals with them. We used the naan bread for making a variety of individual pizzas and also just put it under the broiler and cut them into wedges to accompany a family favorite, my Indian Red Lentil Dip. The perfectly crispy exterior and light and chewy interior of La Brea Bakery’s Naan Flatbread is so good! I LOVE BREAD. Of any kind. How about you? According to a recent study, 92 percent of consumers believe that ‘breaking bread,’ or eating a meal with others, provides a great opportunity to catch up with friends and family. And 74 percent believes a good meal always includes bread. Do you agree? To celebrate this love of bread, La Brea Bakery launched their Breaking Bread Tour, which traveled across country to eight cities this Summer, including my area of Seattle. The tour is wrapping up this weekend and if you’re lucky you can still catch them! To further celebrate our love of bread, La Brea Bakery is going to share FOUR of their breads with TWO of you! Two randomly chosen winners will each win the following artisan breads: Sourdough Loaf, French Baguette, Ciabatta and Plain Naan Flatbread. All you have to do to enter is leave a comment telling us why you love bread and/or your favorite way to enjoy it. The winners will be contacted via email and if no response is received after 48 hours a another winner will be chosen. This giveaway is open to U.S. residents and will end Friday, September 25th at midnight PST. Okay, now let’s talk about Pizza! 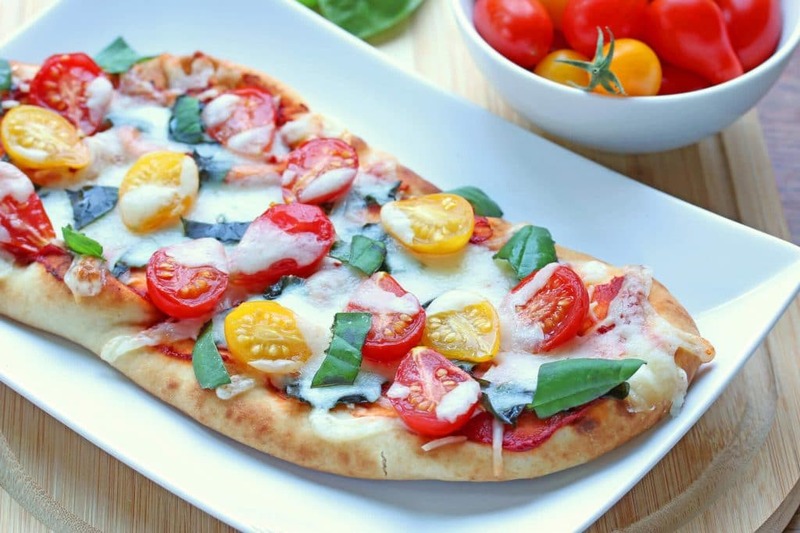 The texture and size of La Brea Bakery’s naan flatbreads makes them perfect for quick individual pizzas. And with a great crop of fresh tomatoes and basil in our garden, one of our favorite pizzas – Pizza Margherita – was the obvious choice for creating flatbread-style. And you know what? We haven’t been able to get enough of them since because they’re sooooo delicious! Pizza Margherita is known for its simplicity of ingredients while yielding positively scrumptious results. It’s simply hard to beat that classic Italian combination of fresh vine-ripened tomatoes, sun-baked basil and oozing cheese. 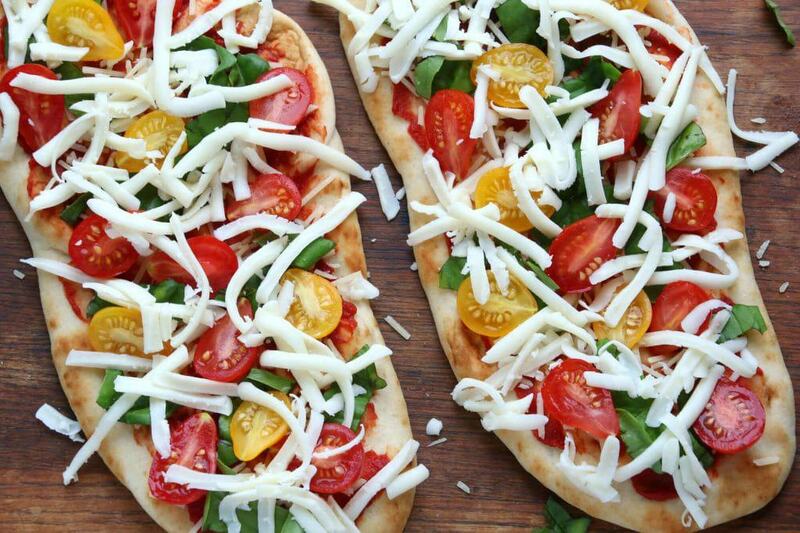 These Margherita Flatbreads are something you can whip up in the spur of the moment and have a truly satisfying meal. And if it happens to be Winter, well then you can enjoy these for a burst of Summer flavor to warm you over during the cold months! I used tomato paste instead of sauce for more intense tomato flavor. Spread some on each flatbread. Sprinkle with some Parmesan cheese and chopped fresh basil. Top with some chopped tomatoes. Sprinkle with shredded Mozzarella cheese. That’s it! Now it’s ready for the oven! Preheat the oven to 400 degrees F and bake for about 5 minutes or until the cheese is melted and bubbly and just beginning to turn golden in a couple of spots. Remove from the oven and let the flatbreads rest for a minute before serving. As simple as 1-2-3, these will be on the table or in your hands in just 10 minutes! Spread about a tablespoon of tomato paste on each flatbread, then sprinkle each one with about a tablespoon of Parmesan cheese followed by the basil. Top with the tomatoes and then sprinkle on the Mozzarella. Bake for 4-5 minutes or until the Mozzarella starts bubbling and just barely begins to turn light golden in a couple of places. Remove from oven and let rest for a minute before serving. Disclosure: A special thank you to La Brea Bakery for sponsoring this post! It’s always a pleasure working with and sharing brands that I love. As always, all opinions are entirely my own. Oh I’m going to miss all these beautiful tomatoes now that summer is slowly fading away! This is a gorgeous, easy dinner idea! Yum! I’m a bread lover in a big way! I love my own and also from the bakery or shop. I love bread with parmesan and butter! Thank you for the wonderful giveaway. So many pretty photos. 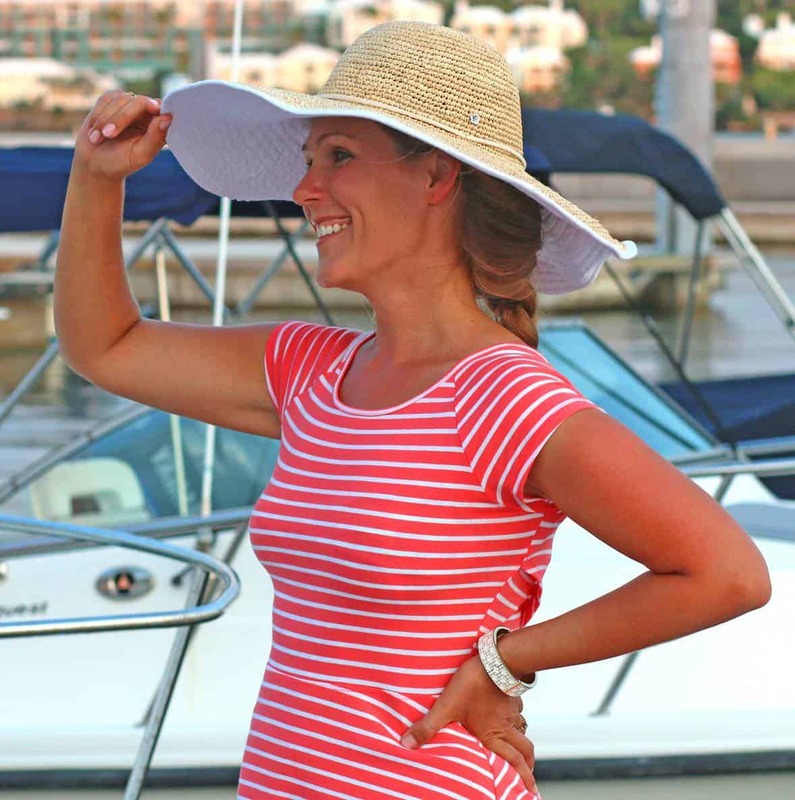 This makes me miss summer already! 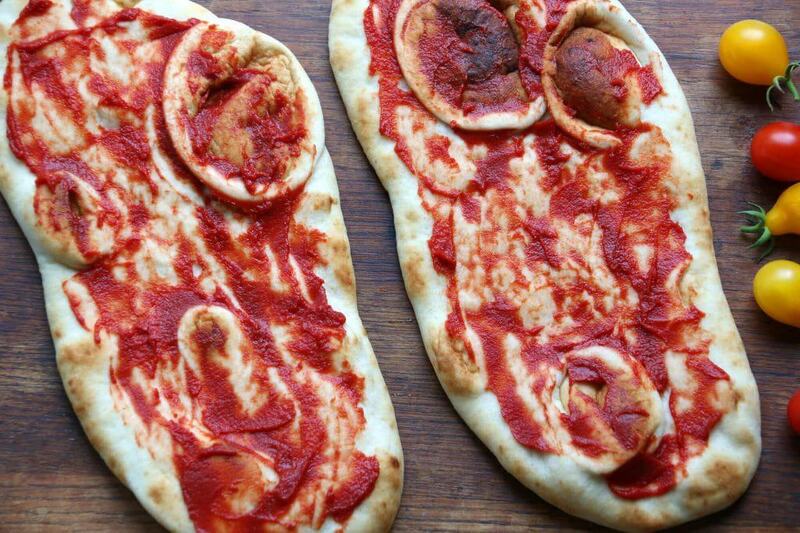 Great idea for the flatbread! I love flatbread pizzas! This looks so fresh and delicious! I can hardly wait to try this pizza! Sounds yummy and light. Bread is a staple in my house. I use it to thicken soup, for sandwiches, as a side, as a bowl, and alone with butter. I can’t even believe La Brea Bakery has flatbread! I have to look for it, since I adore their breads. I want to try your recipe, which looks so fresh and easy. I guess we can also use it on the tortilla wrap? I have the wrap on hand but no flat bread around. Hi KP Kwan, I wouldn’t recommend a tortilla, it’s just too thin and wouldn’t do well for pizza. Naan/flatbread is the same width as thin pizza crust and, being yeast dough, has the same texture. Bread in all its forms somehow feeds the body and the soul. Favorite way to eat it? Hot out the oven with just a little butter! I love, love, flatbread pizza! Those sweet little tomatoes are the perfect topping too! Yum, I love flatbread, these pizzas sound wonderful and the colors are so vibrant and inviting! 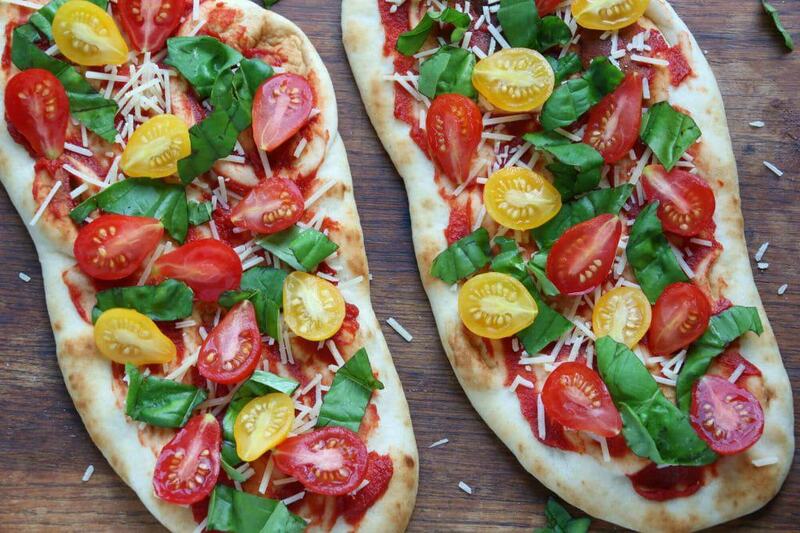 These flatbread pizzas look scrumptious! I love La Brea Bakery naan and will definitely give these a try, thank you! I couldn’t live without bread! I love all kinds of breads, hearty and dense and light and crispy. With butter and jam or cheese and cold cuts, or used as an ingredient in a recipe, I’ll take bread any which way! I can’t live without bread in my day! I love artisan breads they are hearty and heavenly. 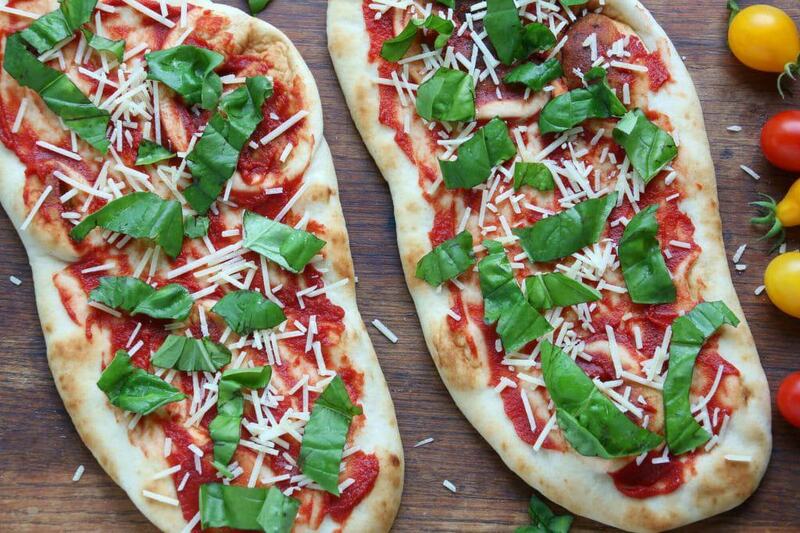 I will give these flat bread pizzas recipe a try. I have been wanting to give La Brea Bakery naan a try also. bread is such an amazing comfort food. we go to our local farmers market every saturday and load up on bread and pastries from a bakery – flat bread is one of my favorites! and baguettes! I love chopped mini tomatoes on a pizza! They add such a great flavor and texture! I’m with you about pizza, I enjoy most kinds (no meat). 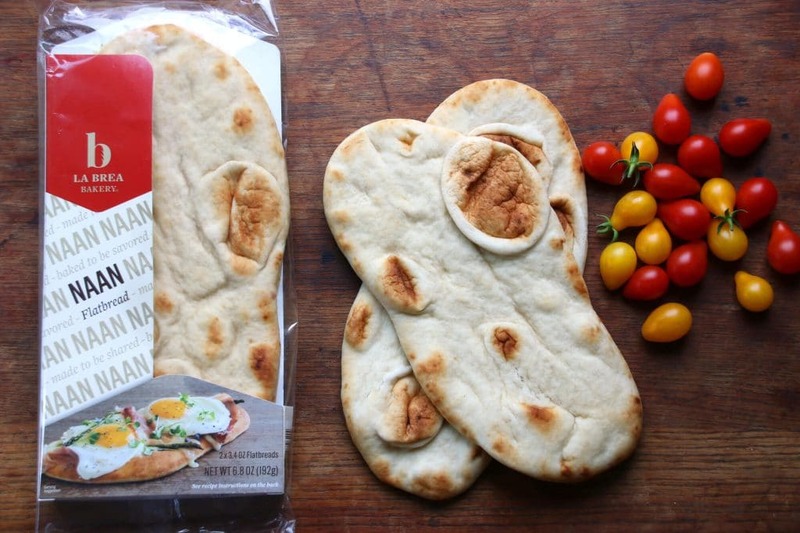 Nice idea and use of the Naan flatbread. 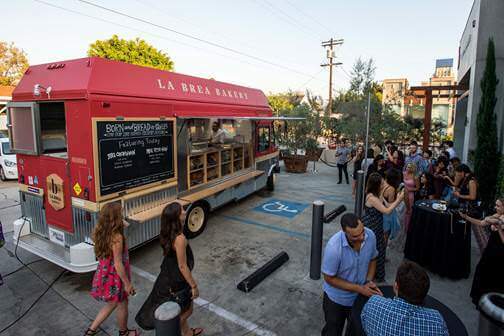 How neat is that, a traveling breaking bread tour/La Brea bread truck! Is there anything better than bread? How can you possibly go wrong with the food of the ages! I’m unfamiliar with La Brea Naan, but they do look tasty. Especially covered with cheese, tomatoes and basil! To me, this is pizza perfection! I love the idea of using naan bread! Thanks for a sweet giveaway. I have never tried their brand, but I like me some bread for sure! I love eating some toast in the morning with some eggs or nutella. I enjoy a good turkey or ham sandwich anytime! I love breads when they are fresh and chewy. I love that I can slice them up and toast them in my pan with cheese and butter and I love that I can make an amazing pizza on top of it if I want! I love that I can stuff bread with all sorts of yummies and I love bread all alone! :) I LOVE BREAD!!! This is the perfect weeknight meal! I love those gorgeous fresh tomatoes paired with basil! I have never heard of this bread, but I want to! BOY this looks great! YUM! Our family would love this! I love bread – for breakfast, lunch, and dinner! Simple toast with jam is great. 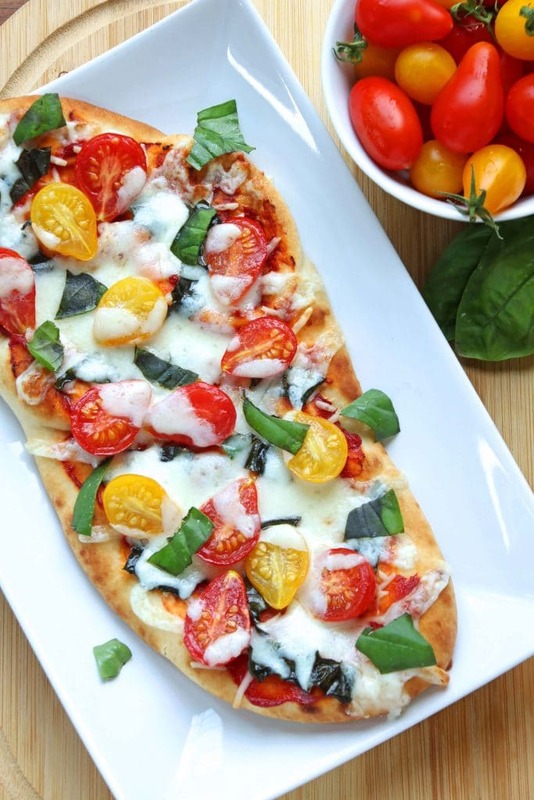 These flatbread pizzas look delicious and so simple to make. That’s my kind of pizza! 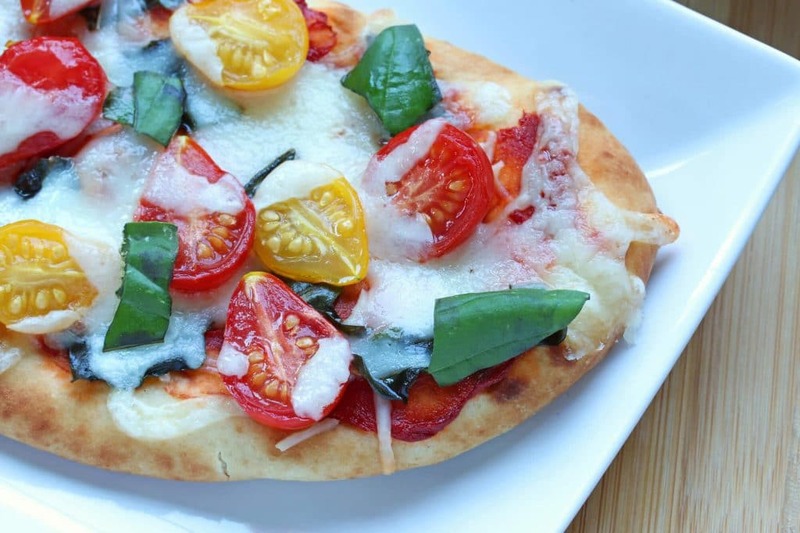 Flat bread pizzas are so yummy and I love that they have made a huge presence in recent years. They are unbelievably simple and easy to make diverse for every family members tastes. I like bread plain, on pizza, or sandwiches, subs etc. My favorite way to enjoy bread is in sandwich form! Love how beautiful these are. So vibrant and so fresh. I love all kinds of bread. I guess my favorite way of using it is to make sandwiches–preferably toasted. Bread is so versatile!! I love using it to soak up sauces, everything from marinara, egg yolks, and the goodness at the bottom of a bowl of mussels! Best memory. Having Bakers’ dozen meeting with Nancy Silverton at LaBrea Bakery. Bread is delicious. My favorite way to eat bread is fresh from the oven … still nice and warm, with a little bit of butter! Delicious! Oh man that looks absolutely delicious. I absolutely love baguettes and also making paninis! They are my favorite! My 25 yo son is autistic and LOVES bread! His favorite treat is to rip off pieces of a French loaf and just nibble! You’re pizza recipe looks like something he would be able to help make and definitely enjoy eating! I just love all crusty breads; especially the breads that are dense and delicious. I can eat them with lots of butter or seasoned olive oil, or just dip them in a marinara sauce. They make great sandwiches, of all kinds. Bread is the staff of life and they are part of my daily diet. Bread starts my day and it makes me feel good. Thank God for bakers who usually work during the early morning hours to produce these wonderful breads. I often make bread in either the bread machine or when I need to slow down by hand; don’t you love how the kneeding feels in your hands as it begins to come together? It is hard to keep my family from cutting any breads as soon as they come from the oven; I often make a honey butter or other infused butter & the bread is plopped on a breadboard, pieces are torn off (never cut) butter is slathered & the best ever family conversations ensue. I would love to have these breads as now the crisp days have me bringing out the soup pot. I love bread because it’s so easy to change its texture, its purpose, with changing just one or 2 ingredients. A different pan, a longer rise and it’s a completely different production ! I have a recipe that I love and when I add fresh rosemary to it – holy cats. There is nothing like bread for a little comfort, especially if it is still warm from the oven. A favorite memory from childhood is my mom’s rye bread, spread with butter and sprinkled with some salt. Her parents were German, and the salt thing probably came from them. As a runner I eat a great share of bread, using the carbs to fuel my workouts. I love all breads but am particular when it comes to pairing varieties with the occasion. These little flatbreads look amazing! Love all that fresh flavor piled on top. Hello! First, those pizzas look amazingly good! It’s so versitle. I can top it either sweet or savory – or, if I choose – mix whatever combination of topping I like right into the dough so it’s grab and go! My favorite way to eat bread is when it is toasty warm… It taste so good and the smile always puts a smile on my face! This flatbread pizza is beautiful! We always have Naan Flatbreads around for homemade pizzas! They’re the best! Thanks, Angie! I know, the naan bread is super convenient and tastes so good! 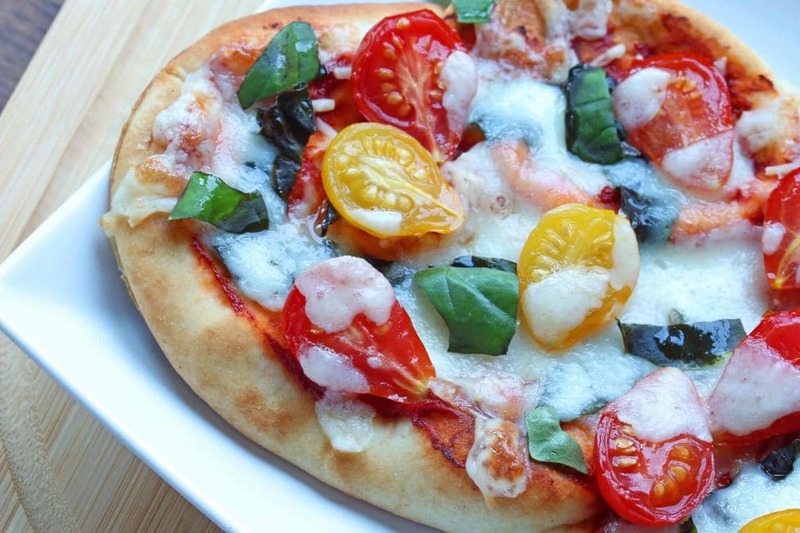 I can’t wait for fresh tomatoes to make this tasty pizza!